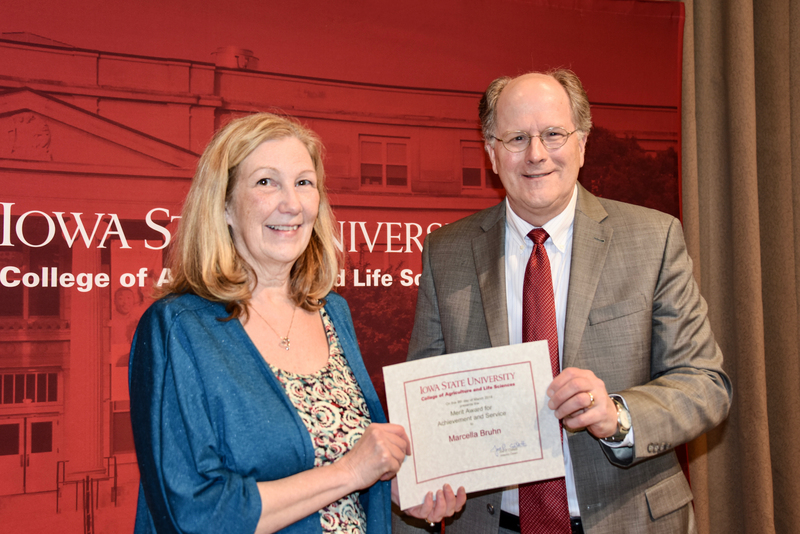 Marce Bruhn received the Merit Award for Achievement and Service at the Spring Awards Program of the College of Agriculture and Life Sciences at Iowa State University. She has worked for DRMS for over 30 years, correcting DHIA data to ensure our customers have the cleanest, most accurate data for managing their herds. "Marce is very vital to the operation. Her role is to ensure the utmost quality in the records that are provided back to the producers as well as made available for genetic evaluations and industry partners throughout the US. The records are used heavily for research purposes by Iowa State University as well as other research organizations. On a daily basis Marce reviews the edits that reject records that are in for processing and fixes them. She also handles any corrections to records previously submitted and answers questions from the producers or other dairy industry personnel in regards to the use of the information and why some records may not have received a genetic evaluation by the national Council On Dairy Cattle Breeding (CDCB). "Marce is extremely meticulous in testing new development and also correcting any production records or identification for animals currently in the system. When corrections are submitted to CDCB for genetic evaluation she always confirms they are received by checking their website. This ensures that dairy producers served by DRMS properly receive their genetic evaluations and the data is used by the dairy industry. "DRMS is one of four dairy records processing centers. DRMS is known for high quality data. CDCB has provided data that reflects that a higher percentage of records submitted by DRMS are usable for genetic evaluation than any other center. Marce is responsible for a big portion of why the data provided by DRMS is of such high quality. Her commitment to excellence is appreciated by DRMS, Iowa State University Animal Science Department and the dairy producers and industry personnel." Click here to read Marce's comments about receiving the award.